What if I want more structure to work through this? If you’re already familiar, you can skip to the next section, ‘How do I get started?’. The Business Model Canvas (BMC) gives you the structure of a business plan without the overhead and the improvisation of a ‘back of the napkin’ sketch without the fuzziness (and coffee rings). Focus: Stripping away the 40+ pages of ‘stuff’ in a traditional business plan, I’ve seen users of the BMC improve their clarify and focus on what’s driving the business (and what’s non-core and getting in the way). Flexibility: It’s alot easier to tweak the model and try things (from a planning perspective) with something that’s sitting on a single page. Transparency: Your team will have a much easier time understanding your business model and be much more likely to buy in to your vision when it’s laid out on a single page. Good for… Brainstorming alone or in a small group Documenting the Canvas in Google Doc’s or MS Office (PowerPoint) Documenting a canvas (if you have a Mac & Omnigraffle) This is a nice tool and very robust. *Omnigraffle a popular diagramming program for the Mac. It has a fairly easy to use layering environment which you may find handy as you want to tinker with and produce different views of the canvas. You can try Omnigraffle for free (the basic paid version is $99). If you’d like a little more structure, the link below will take you to a related curriculum item that has workshop slides, prep. items, and agenda. Otherwise, the next sections (10 steps) offer a tutorial on how to use the template. The closing sections describe how to use the Google Doc’s/PowerPoint and Omnigraffle templates. Do you have a single or multi-sided market? If you have a multi-sided market you’ll have at least as many segments as you have sides. An example of such a market is a media property like CNN.com: they have readers on the one side and advertisers on the other. If the segment dimensions are the ‘macro’ analysis of your customer base, then looking within each segment at individual customer types as ‘Personas’ is the ‘micro’. As with economics, this is where most of action happens. You should be able to visualize these Personas- what kind of shoes do they wear? And you should understand what they think, see, feel, and do in your product area. Be sure to list both buyers and users of your product (many Personas will be both). For coaching on this, check out: Tutorial- Personas. What job are you doing for the customer? What need are you fulfilling? There are no new behaviors- make sure that you can identify an existing need/problem and identify specific alternatives that your customer uses today. If you’re not sure, go out and observe, talk to some representative people. You’ll want to be able to clearly link your Value Propositions back to these in the next section. Notes: If you’re spending a lot of time on this first item, that’s OK (and it’s probably good). The Canvas is a tool, not a strategy and not all the nine blocks are equal. The pairing of Customer Segments and Value Propositions is really the ‘independent variable’ that should be driving everything else in your business model. When I use the Canvas in my Venture Design classes, we usually spend all of the first session (plus time for field research) on Customer Segments and Value Propositions. Which of the Problems or Needs that you identified in your Personas are you fulfilling? What is unique about your Value Propositions and why does your customer prefer them to their Current Alternatives? You may have a whole lot of these- and that’s fine. When you’re getting going with this, jot them all done on a whiteboard, index card, Post-It, etc. But then rank them and you’ll probably want to winnow out all but the most critical. What things do you do that actually cause a customer to pick you over a competitor or alternative? For example, at Leonid, an enterprise software company I founded, we thought our largest customers worked with us because of the cost savings we offered and our knowledge about best practices. It turned out that was mostly wrong- reducing their time and risk to get new services to market was the most important. It’s not that the other things weren’t important, but they weren’t the top Value Proposition. That made a difference on how we sold the product and how we focused on operationalizing it for customers. This mapping says ‘We have 3 personas. Persona 1 cares about VP 1 & 2. Persona 2 cares about VP 2; Persona 3 cares about VP3. (One segment only so segments not noted)’. Output: a prioritized list of Value Propositions and linkages from each Personas to the VP’s relevant to them. Notes: Again, this pairing is the key driver for most business models and if you want more on how to describe and discovery what to put in this part of the canvas, I recommend this: Tutorial- Personas. Maybe you feel like you’re in good shape on understanding the customer’s world but you don’t have any validation on whether the Value Propositions are clicking because this is a new venture? If you’re not sure, that’s OK and good for you for acknowledging the uncertainty! It’s the responsible thing to do. The key is to write down those assumptions, prioritize them, and figure out the quickest and cheapest way to prove or disprove them. That’s what Lean/Startup is about and there are resources here to help you with that, if you’d like- Tutorial: Lean Startup. Channels includes entities you use to communicate your proposition to your segments, as well as entities through which you sell product and later service customers (see AIDAOR journey below). For example, if you sell bulbs for light houses and there’s a website all light house attendants purchase equipment, that site is a sales Channel. If you use Google AdWords, that’s a Channel, too (for getting attention). If you use a third party company to service the bulbs when they break, that’s also a Channel. Output: a list of important Channels, linked to Personas or Segments if they differ substantially. Make notes on what steps are relevant for each- promotion, sales, service, etc. See Note this section for more structure on this. Notes: Channels and the next item, Customer Relationships, define your interface with the Customer. It’s important to think all the way through the customer ‘journey’ in specific terms. For most businesses, the way they get a customer’s attention is different than the way they onboard them or support them over the long term. For this, I recommend the AIDA.OR framework (attention-interest-desire-action-onboarding-retention) and storyboarding your way through it. Here’s a post explaining all that- Storyboarding AIDA(OR). If you don’t want to do the storyboards, I recommend at least making notes about your customer journey through the AIDA(OR) steps. Another consideration is whether your channels will give you enough visibility into the user, including, for example, a way to follow up with users. Not sure? Document your assumptions Lean Startup style and figure out how you’ll quickly prove or disprove them. – Can you make the numbers work? – Is there a premium support product you need to create/test? Many companies, like Apple, have rejected the false choice of ‘Do we provide phone support or not?’ instead offering personal support for a reasonable charge. Output: a description of Customer Relationships, with notes if they differ across Customers (between Segments or among Personas within a Segment) or across the customer journey. Notes: If you’re a startup, be sure to document and review critical assumptions here. Also, the focal items are in a kind of specific order- you should validate your Segments and their relationship to the Propositions above all else. If this means you provide personal support in the early days (a ‘concierge test’ in Lean Startup terms) to do discovery and validation of Segments and Propositions, that’s OK. You can subsequently test the Customer Relationship models. (Here’s a post on using consulting as a concierge vehicle in B2B if you want more detail: Consulting as B2B Concierge Vehicle). I won’t bore you with proclamations about the importance of revenue- you get it. If you have an existing business, this will be self-evident. At this point, you should map Segments to Propositions to Revenue Streams. The example below says ‘Revenue stream 1 is driven by Persona 1′s involvement with Propositions 1 & 2; Revenue Stream 2 is driven by Persona 2′s involvement with Proposition 2; and Revenue Stream 3 with Persona 3′s involvement with Proposition 3.’ That’s relatively diverse- yours may be much simpler and that’s fine. Notes: If you have a startup or are re-engineering the business, this is a time to look at where you’re driving revenue and whether it aligns with the rest of your focal points. Are you charging on value? Perceived value? They say everyone loves their banker; hates their lawyer. Why is that? Is there an actionable analog in your business? These are the crucial things the business needs to do to deliver on its propositions and make the rest of the business work- for example, if selling through 3rd parties is part of the model, then activity around channel management is probably pretty important. For a product-driven business, this probably includes ongoing learning about users and new techniques to build better product. If you’re focused on doing a bunch of things for a particular set of customers (ex: comprehensive IT for law offices), this probably includes maintaining superior expertise on the segment(s) and creating or acquiring products and services that are a good fit, whatever that entails. For an infrastructure business (ex: electric utility), it probably includes keeping the infrastructure working reliably and making it more efficient. Outputs: a list of Key Activities linked to your business’ Value Propositions. Notes: One question this analysis should raise for you is whether or not certain Activities and Resources are actually core, actually focal to your business, something you’ll want to think through . Key resources are the strategic assets you need in place, and you need in place to a greater or more targeted degree than your competitors. 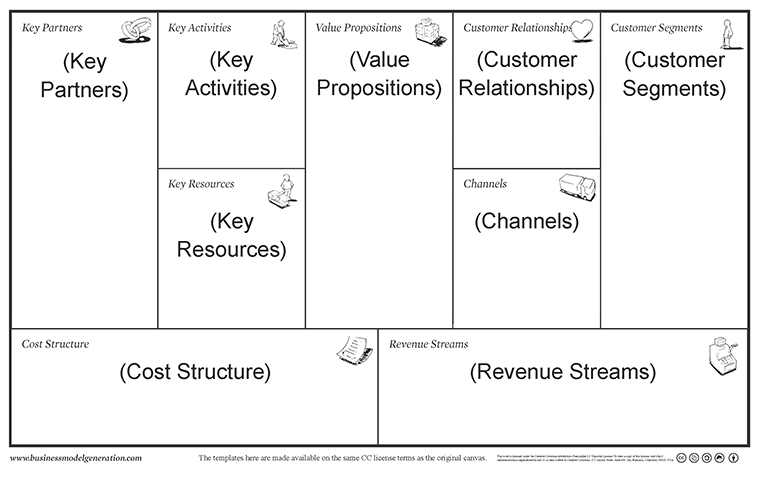 The Business Model Canvas proposes that there are three core business types: product, scope, and infrastructure. These tend to have similar types of Key Resources. Outputs: a list of Key Resources linked to your business’ Key Activities. Notes: Product-driven businesses have a differentiated product of some sort. Rovio, the company that makes the popular app Angry Birds, is such a company. Key Resources in product-driven businesses are typically key talent in critical areas of expertise and accumulated intellectual property related to their offering. Scope-driven businesses create some synergy around a particular Customer Segment. For example, if you started a business that would take care of all the IT needs for law firms, that would be a scope-driven business. These businesses typically have key knowledge about their segment, a repeatable set of processes, and sometimes infrastructure, like service centers. Infrastructure-driven businesses achieve economies of scale in a specific, highly repeatable area. Telecommunications is traditionally an infrastructure business. Retailers focused on retail, like Walgreens or Costco, are primarily infrastructure-driven businesses. The Key Resources for this type of business are, you guessed it, various types of physical or virtual infrastructure. Let’s take a single product category: diapers. The Honest Company or another innovating around compostable or otherwise more environmentally friendly diapers would be a product-driven take on the category. Procter & Gamble which has a cradle-to-grave strategy for providing consumer products is a scope-based take; so are various baby-focused retailers. Kimberly-Clark (wood pulp) or DuPont (chemicals and polymers) are both infrastructure-based takes: diapers is just another way to sell something they produce at scale with relatively little differentiation. At this point, hopefully the Canvas has helped you sharpen and articulate your business’ focal points. What Activities and Resources are important but not aligned with what’s uniquely strategy for you? What’s outside of your business type? Could partners do some of those? Why? Which? I recommend mapping Key Partners to Key Activities. If an activity is key, it’s still part of your business model. This is a way to denote which specific Partners are handling various Key Activities for you. Output: a list of Key Partnerships with notes on their relationship to Key Activities. You’ve worked to understand how your Key Activities drive your propositions and hence your revenue. How do they drive costs? Are those costs well aligned with the key Value Propositions? Are the costs more fixed or variable as you test different business models? Are they more linear with your scaling or more fixed? You’ll want to have these in mind as you tweak your model. If there are major cost components that don’t map to a Key Activity, I’d take a closer look at those costs. Congratulations- you have a working canvas! The section below offers a few analytical ideas and suggestions for next steps. – Does it make sense? – Could it be better? – Does the rest of my team understand and agree? Have additional ideas? The canvas does a good job of helping you figure out your business, which is a good place to start. You also want to look at the competitive environment and think about if and how you have/maintain a long term competitive advantage. For this, I like Michael Porter’s Five Forces framework (Wikipedia Page; see also Chapter 2 of ‘Starting a Tech Business‘). Try walking through the Five Forces for your company and then bounce back to your canvas. How does it all hang together? You’re having trouble crystallizing your Customer Segments and Value Propositions I recommend the material here on Personas. See also Chapters 1-3 of ‘Starting a Tech Business‘. This will help you create a deep, actionable understanding of your customers. You’re looking for a more end-to-end view of how to design the venture- customer discovery, Lean-style experimentation, product design, product development. The Venture Design materials provide a more comprehensive view of how to approach a new product or venture. You’re looking for a systematic way to organize your work on the venture over a period of weeks. Startup Sprints is a popular program for stepping through a new product and/or venture. It’s organized around agile-style iterations which you can size according to your pace. You’re not sure how much product to build (vs. license, leverage, etc.) or how to put it together. See Chapter 4 of ‘Starting a Tech Business’. This will help you think about what you need to build from a functional perspective so you can look at the available technology objectively and make strategic design decisions. You’re not sure where and how to partner. See Chapter 8 of ‘Starting a Tech Business’. This will give you a framework to use in partnership evaluations and a supplemental example. If you’re not familiar with it, Google Doc’s is a web-based office suite, similar to MS Office. If you have a gmail account, you can access it (no guarantees- that was the case last time I checked). 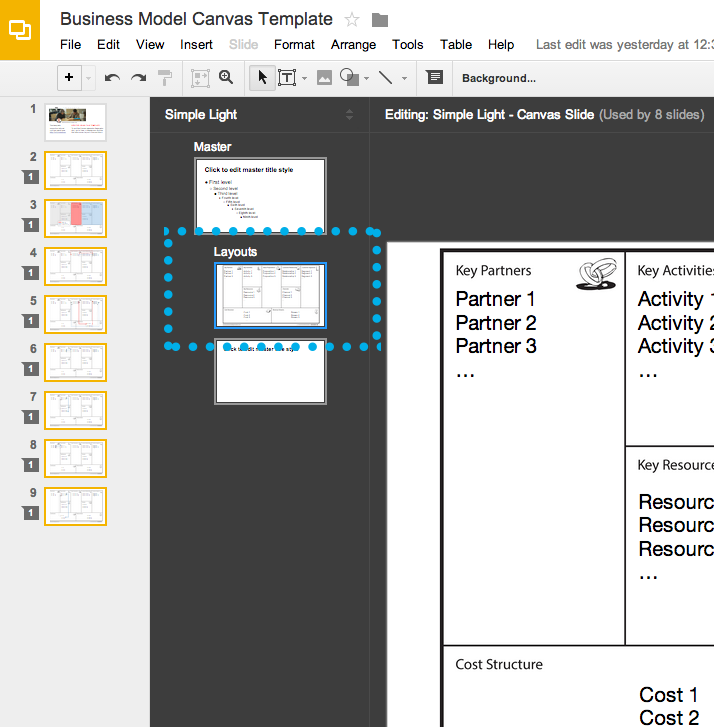 First, you’ll want to link to the template file: BUSINESS MODEL CANVAS TEMPLATE IN GOOGLE DOC’S. Once you’re accessed the file, you can make make it your own by going to the File menu and either ‘Make a copy…’, creating a copy in your own Google App’s domain or you can use the ‘Download as…’ option to download it as PowerPoint (and a few other formats). Last note: The lines with multiple bends that you see are called a ‘Polyline’ in Google Doc’s. If you click the downward arrow on the line item in the menu bar, you’ll see it. What’s your experience with the Canvas? How have you used it? What worked? What didn’t? Please consider posting a comment! Want to master the Canvas?